Surtees is massively revamping its fleet of aluminium fishing boats. The new Surtees 750 GameFisher is one such boat to be fully upgraded and improved. 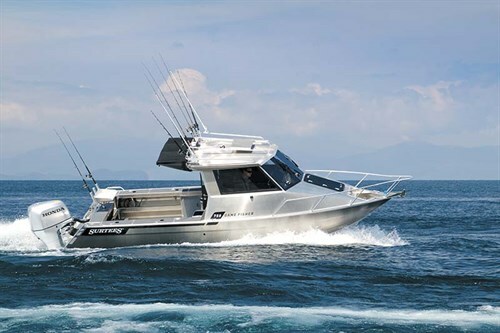 The new Surtees 750 GameFisher is a stretched version of the Surtees 730 GameFisher hull. 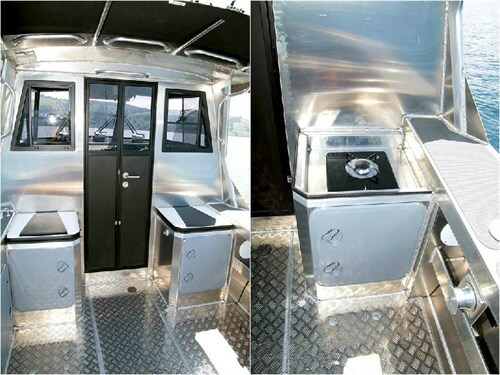 However, there’s nothing stretched about the performance of this winning new aluminium fishing boat. With upgraded hull thickness and more water ballast it offers all the benefits of its proven hull design, plus significant extra cockpit space. Since the first Surtees aluminium boat rolled out of Neil Surtees’ workshop in the 1990s, Surtees Boats has gathered more than 24 industry and boat-show awards for its various models. This newest iteration of their popular gamefishing platform, the Surtees 750 GameFisher, is sure to garner a few more awards. The result of market demands for a bigger fishing area, this new model builds on the company’s very successful Surtees 730 hull but has 200mm of extra length in the cockpit. 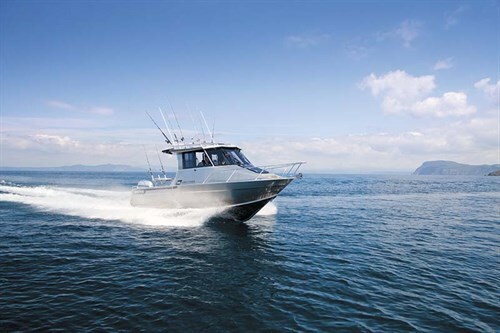 Surtees Boats has long been at the forefront in introducing unique features to the NZ and Australian markets, primarily intended to maximise stability and safety. A self-flooding ballast chamber (540lt worth in the case of the new Surtees 750 Game Fisher) runs along the length of the keel line of its hull. This chamber fills with water when the boat stops moving forward, allowing the boat to sink slightly lower and stabilising the hull considerably. When power is applied, the chamber empties rapidly, reducing weight and allowing the hull to rise onto the plane. This feature allows all Surtees boats to have the best of both worlds – a very fine entry and a steep 20° deadrise – for a superb rough-water ride and high-speed performance; and a hull that is ultra-stable at rest. The fact that several other manufacturers now incorporate a similar concept into their hulls is proof of the success of this feature. 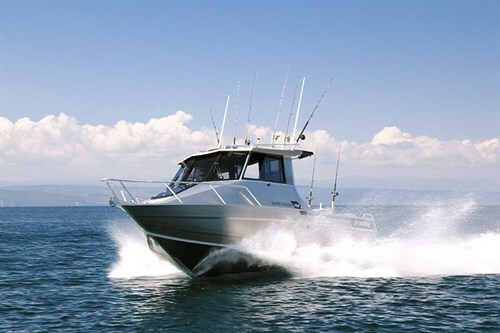 A step-through transom leads from the wide boarding platform to the oversize cockpit, thanks to the extra length of the Surtees 750 GameFisher. When fighting large gamefish there is no such thing as too much space and the length, combined with the beam of 2.5m, gives this boat a massive cockpit. A hatch along the transom hides the batteries and also folds down as a bench seat. Of course numerous rodholders are fitted into the gunwales and transom, with a baitboard and three more rodholders atop the transom. A nice feature is the installation of plastic inserts next to the gunwale rodholders, which can serve as drinkholders or places to drop your sinker when a rod is in the holder. The high-roof hardtop cabin has fully closing folding doors, providing protection from the elements and creating a snug overnight cabin. In the forward corners of the cockpit, under an additional canopy, are seats with upholstered squabs. These lift off to reveal a gas cooker on the starboard side and a sink, with gas califont for running hot water on port. The recessed shower head on the basin side lifts out to provide a hot shower facility. An 80lt freshwater tank provides plenty of water for an extended trip, while a craypot hauler is installed on the starboard gunwale. Inside the cabin the helm passenger position has a luxury padded seat with flip-up bolster for optimal seating or standing position. This is mounted on a pedestal containing a small fridge. As yet there was no skipper’s seat installed in the boat, as the new owner intends to install his own option. 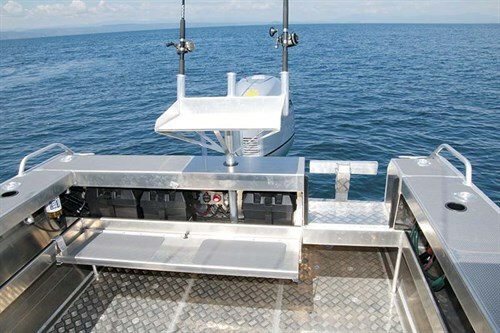 The review boat also had no electronics fitted, although the owner has selected a $30,000 package including no less than three touchscreen display units. Steering is by a hydraulic system. The deep windscreen features sturdy dual-arm wipers on all three panels, a necessity in the often-rough offshore conditions that this boat is going to be used in. Sliding side windows provide for fresh air. 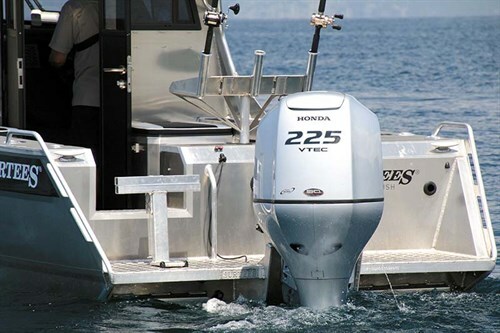 Our review boat had a silver 225hp Honda VTEC four-stroke outboard motor hanging off the back, although this was a review motor installed purely for our test. This specific Surtees 750 GameFisher hull is destined for a buyer in Australia who will install a locally-supplied engine (the regular Australian offering comes with a Yamaha F225XCA outboard). The hull is rated for between 200 and 300hp, and the underfloor 300lt fuel tank provides an extended range for gamefishing. It was a simply stunning day when we rendezvoused at Lake Taupo in the central North Island. Slipping the big Surtees off its trailer into the crystal clear water, we soon had the Honda VTEC bubbling away quietly as we eased out of the 3kt zone. Once clear of the restricted area we pushed the throttle wide and skimmed along at more than 30kts in the superb conditions. In fact, we were able to touch on 38kts at wide open throttle, although in the calm water it didn’t feel like we were travelling at anything like that sort of speed. It soon became clear how stable this hull is, with it slicing through any wake we could find. Granted the lake surface was as flat as a pancake, we still managed to throw the Surtees around over its own wake and those from the large tourist boats, finding it stable and comfortable. The extremely rigid hull, thanks to six welded underfloor stringers, is quiet even through the chop and the boat certainly stands up to the Surtees claim to be a "non-pounding hull". Acceleration was fantastic with the Honda outboard, despite being at the lower end of the rated horsepower for this hull – the mind boggles at how this hull would perform with 300 horses off the back. We tried standing starts and backing up fast, the boat handling both with ease. The Honda was quiet idling and at full roar, attesting to the engine’s smoothness but also to the sound-dampening qualities of the rigid hull. At rest the hull settled down almost imperceptibly and in the photos hereabouts you can see how it has settled nicely onto the chines. This makes for superb stability, rivalling a pontoon boat, in fact it is one of the most stable monohull boats I have ever tested. When we got up to speed those same chines did a great job of directing the spray down and away from the boat, and although we were not able to put this to the test the 750 GF seems to be a pretty dry hull. Since this boat has already been sold, we had no chance to test out its fish-catching abilities and all too soon we had to turn around and head home. Back at the ramp we were able to pull the big Surtees 750 GameFisher onto its custom trailer with minimal effort, thanks to the self-engaging trailer hitch system. Surtees makes its own trailers at a separate facility close to its boatyard in Whakatane. For safety when towing the trailer has a Carlisle electronic override braking system, with stainless steel calipers on all four wheels. The new Surtees 8.5 Game Fisher Widebody is a thrill to behold – from the helm or viewed from afar.